Download your copy now – only $26.45! 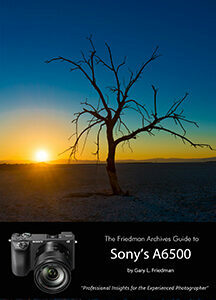 Written for one of the best travel cameras ever made, this comprehensive yet easy-to-understand guide for the Sony Alpha A6500 is written for the advanced user (with tutorials and easy explanations in case you’re not so advanced). In it we provide a thorough guide which explains each feature in plain English and provides hundreds of visual examples as well. There is no better way to learn about and get the most out of your camera. And you can try it risk-free – read on for details! * All about 4K video, S-Log2 and S-Log3 gamma curves, and a clear explanation of the alphabet soup that are the different video formats. * A set of “Cliffs Notes” cards you can print showing the recipes for common shooting situations, and the author’s Personal Camera Settings. Get the most out of your investment and enjoy learning more about it at the same time!